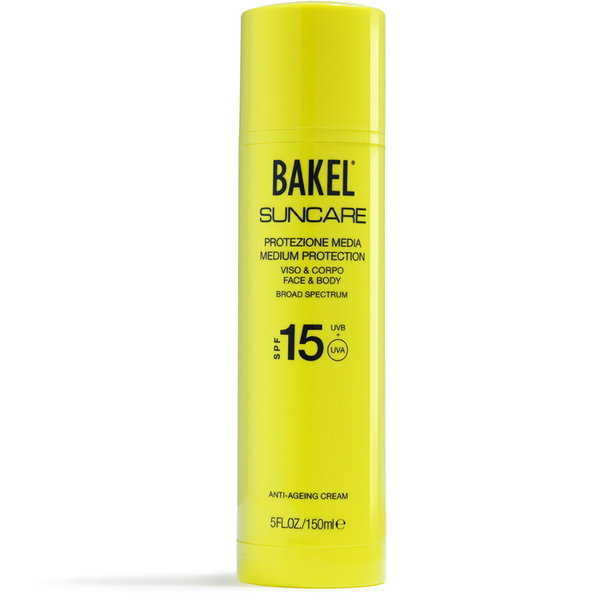 Nourish and protect your skin with BAKEL Suncare Face & Body Protection SPF 15, an anti-ageing sunscreen that provides medium, broad spectrum protection to help combat premature ageing and free radical attacks. Enriched with a host of nourishing ingredients, including vegetable oils, Hamamelis Water and Chamomile, the sun lotion glides effortlessly over skin, delivering a protective veil that helps soothe, calm redness and reduce oxidative damage from the sun's rays. Its emollient and firming properties leave skin feeling soft, and its vegetal active ingredients inspire a healthy, glowing tan. Skin's tone and elasticity is improved. 100% natural active ingredients. Dermatologically tested. Vegan. Free from perfumes, PPG, PEG, alcohol, silicones, colourants, MEA, DEA, TEA, EDTA, petrochemicals, sulphates, animal derivatives and all other useless substances. Apply the product evenly on the face and body in sufficient quantity. It is highly recommended to apply sunscreen before sun exposure.